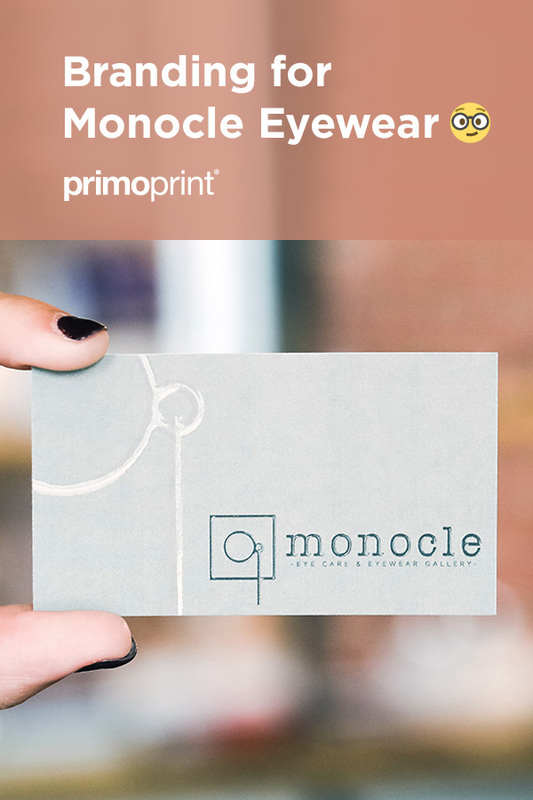 A few months ago a new client came to us in need of a logo, and other marketing materials, for her new eye care company, called Monocle Eye Care & Eyewear Gallery. To get started, we needed to find out a little bit about the business, what she was looking for, and the style/feel of the location. “Monocle really just came from the feel we are trying to have in the office. That old/rustic/vintage look. It also isn’t widely used for eye care practices and we liked that it was unique. A lot of our frames are also moving away from the traditional name brands that the big box stores provide and so we are trying to educate our patients on other options that come from independent brands. This was a great bit of information to get us started. Below are the four logos that we provided to choose from. The client wanted to go with option number 4. After a few tweaks, we had a final logo! Next, we moved on to business cards. This is also where we worked on color combinations. We discussed a few options, but really felt it was important to go with something unique. Browns, reds, and creams are really common colors when going for a rustic, vintage look. We decided to avoid those and go for an olive green and grey color pallet. The business cards were printed on our 16PT Velvet paper with Raised Spot UV. We also designed a greeting card that followed the same color and style as the business card. This card was printed on the 14pt uncoated paper stock. Need a logo created for your company? We’d love to work with you on a new design. Or, if your business logo just needs some updating, we are happy to help with that as well! Click the link to contact us today! What was the Hardest Part of the Process of Designing a New Logo? Deciding what I wanted the logo to portray. There were many options presented that had really interesting looks but weren’t necessarily reflecting the story of my business. A monocle is an old tool in optometry and I wanted the logo to have a classic, vintage appearance to mirror that, yet somehow still feel new. Also- I knew I would be using it on different media such as letterheads, doctor notes, shirts, lens cloths, bags to name just a few- and I wanted to have an attractive look on each. What was Easy About the Process? The flexibility of Primo’s designer. Being able to ask for small changes and see them compared against the other options. I was playing around with wording right until the end and being able to see the changes within the design helped narrow down and finalize my decision. What Advice Would You Give to Someone Who Wants to Build a Logo From the Ground Up? Start by simply looking at logos around you. Look at local businesses, your favorite products, an area of town where you love to be and feel connected- figure out why they speak to you. What draws you to that logo… is it colors, font, shapes, wording? Anything You Wish You Knew Before Getting Started? If you keep going back to the same option/variation and comparing all others to that variation- it is likely the one! There is a reason your eye keeps choosing the same thing. Brooke was extremely patient throughout the entire process. I gave her a basic “feeling” of what I wanted the logo to portray and let her have at it. Once we started narrowing and choosing favorites, she was even able to pick the right color to match our office. Since opening, the 2 biggest compliments I get are about my optical and my logo (even if people don’t know the word monocle or what it means). I’m not sure if a logo always represents the actual look and feel of business but mine surely fits perfect and patients appreciate it!